What outfits for my round midsection? I would like to have effortless chic, well put together, understated elegance, minimal, simple yet stylish … but how do I get this style? I am 162 cm & weigh 69 kg and most of the kilos are in the mid section. I have skinny legs & hands, with a round middle. Next month I turn 52, menopause has changed my shape completely. I don’t want to look frumpy!! Can you suggest some styles for me please ? When our shape changes it is always difficult to figure out how to dress in a new way. The best way to dress a round midsection is to blur it with fluid fabrics and shapes. Forget about anything that defines the waist: high waisted clothes, belts, tight cuts, etc. Set the focus on you best assets which are thin wrists and ankles (and probably a nice decolletage). For the bottom part, you can go for straight shapes that contain stretch fabric for comfort around the waist. Avoid super skinny and above all leggings that would contrast too much with your upper body (anyway I do not consider leggings being pants. Never.). But you can go for above the knee dresses or skirts and wear them with tights. If you like minimal style, go for few but good quality clothes: silky tops and dresses, fluid jackets and warm cardigans will become your best friends. Work outfits do not need to be super sophisticated to be elegant and stylish. Why not replace black with other neutrals and mix them together? Here I picked a fluid V neck black silky top that will cover your round midsection, straight tailored pants that you’ll see only from the top of the leg (the hip area beeing covered by the top), and boots with a comfy heel. If you are not that into heels or if it is too hot in Melbourne you could replace those with minimal black sandals or loafers. To enlighten the outfit, I went for a red bag. If you wear only neutrals, that could be a nice everyday bag. But a black or neutral bag would work as well. I also added a statement necklace. If your upper body is chunky, I recommend you go for chunky necklaces so that you notice them. It levels up the style of your outfit. This straight above the knee dress is the perfect style for your bodytype. Simple, chic yet fun and stylish thanks to its bright color. I added chunky heels sandals that you could also replace with a flat version of them. The stylishness lies in accessories here: a bit of print with the clutch, a hint of purplish pink with the nailpolish and statement earrings to wear with untied or short hair. Jeans are perfect for weekends. Comfy and super versatile. Choose ones that contains stretch and have a straight cut. It could be 7/8 lenght as you have thin ankles. Not too short though or it will shorten you. Wear it with fluid tops mid hip lenght to cover the belly area. In case of chilly weather, top them with a layer that creates vertical lines. Could be a utility jacket, a blazer, a bomber, a straight coat that you would wear opened, eventually with a scarf. Here I chose a cardigan with a fun print that looks young and hip but totally appropriate for your age (and yes, even if that IS a batman print, ok, you can pick some more classic but you get this idea that a bit of fun makes you look younger). 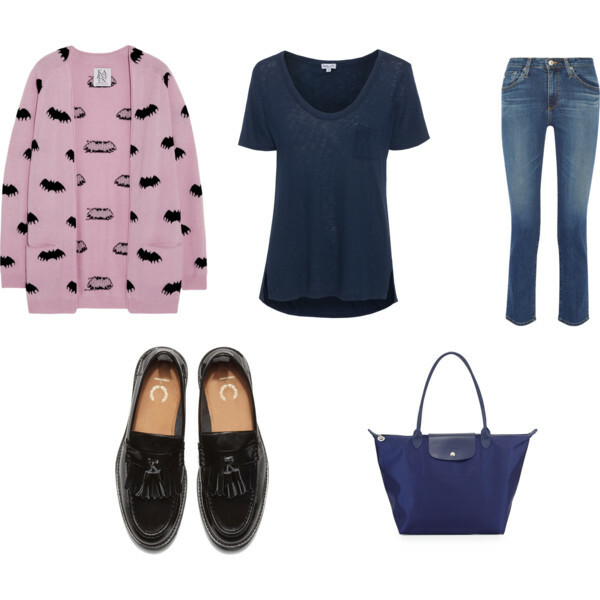 I paired it with super classic good quality items: a pair of lacquered loafers and a Longchamp super light bag.